Bees are one of my favorite parts of summer. Really. Bees say to me that the world is balanced. It's a short-sighted view, I know, what with colony collapse, imported honey bees and the demise of our native bee population. But when I see and hear those fuzzy little honeymakers (and a few of their big bumbling and little shiny cousins) in my garden, the circle seems complete. I've been watching which plants I see bees visiting this year. Of course, it varies, depending on the time of year and whether the plants are flowering. Sometimes they'll skim right over perfect blossoms they were mad about last week. I imagine it's like the choice between some fabulous Moonstruck chocolates or a bag of M&Ms. The M&M's will do when I have a chocolate craving, but I'd much rather have the Moonstruck chocolate, wouldn't you? From the hordes of bees on the agastache, I'd guess this is some fine Swiss bee chocolate. It's a bit hard to see the bees on the agastache in these pictures, but it's even harder to capture them in focus. Don't look for bees in the photo above. But earlier in spring this snowberry shrub was covered in bees, despite its minute and hard-to-see flowers. Maybe the nectar got stale, or maybe there's just some better chocolate out there now. McKay's White Potentilla has been blooming for months. Bees? Naah, they dip down for a quick sniff, then fly right over it. Lambs Ear is a pass along plant I like for its quick, fuzzy grayness, but they don't have a big future in my garden. However the local bees act like it's some kind of high-percentage cacao content chocolate from Belgium. The flowers are so small and hard to see. But the bees seem to find them with no problem. Lavenders are reliable bee-attractors. Even when the flowers are starting to die down, they remain popular chocolate bars for the striped set. There's a lot you can learn about attracting bees to your garden. One good website is the Cal State Berkeley Guide to Bee-Friendly Gardening. It has a good list of plants to grow, many of them native. You just might make your garden into the next Teuscher for bees. This being retired stuff is hard work! I didn't even have the time to post a proper Bloom Day report yesterday. So a day late (and a dollar short, actually) here are some glimpses of what's blooming in the MulchMaid's garden on July 16, 2010. While I'm still battling scale insects, I think the war has essentially been won for the Meyer lemon. It's putting on a renewed burst of blossoms and the fragrance is fabulous. When the garden was young, I planted multiple Hemerocallis 'Stella de Oro' daylilies in a sunny area. They are taking over, so some thinning and moving is in their future. But for now they're a sea of green and yellow. This Zantedeschia 'Flame' is finally coloring this year with the sun it gets now that the bamboo isn't shading it at all. I love both the spotted foliage and the nuanced shading of the flower. This graceful Fuchsia hatchbachii has been better every year, even with our terrible winters of late. The tag says, "To 7 feet in a single season." I don't doubt it if a clement winter is in our future. I showed a stem of Agastashe 'Acapulco Orange' in a recent post, but the entire shrub is worth seeing in full bloom. I am so excited that my Yucca filamentosa 'Bright Edge' bloomed this year. I've been loving the yucca blooms I see all over town this month. I do like my Agastasches. This is Agastache rupestris 'Apache Sunset' and it differs from 'Acapulco Orange' in its fine gray foliage and smaller flower spikes. I think the contrast between the foliage and the flower color is spectacular. This is the most floriferous part of the MulchMaid's garden, with the several potentillas near the ground, the achillea at the midpoint and the crocosmia 'Lucifer' at the top. I'm also enjoying the intense contrast between the bright orange-red of the crocosmia and the cool gray of the eucalyptus behind it. I'm also enjoying the flowers of several sedums. With another burst of energy, this sweet Lewisia cotyledon is putting on its second show of the year. I'm not a rose lover in the garden, but I inherited all these from the former gardener and can't bring myself to tear out any but the sickly ones. Here are a few for you on this lovely July 17th morning. Garden Bloggers Bloom Day is hosted by Carol of May Dreams Gardens. Visit her to see what was blooming in her garden and around the world yesterday. As I posted in June, we were scared of our running bamboo. It was far more vigorous than the type we had at our previous home. In spite of our trenching sand trap method, the bamboo was traveling - too fast. We had the option of some cheap digging labor. So we jumped on it and had ALL our lovely bamboo removed. Gaaaahhh! All our privacy. All our lush green. Three years of growth. Gone. Our neighbor's driveway and house: right there in our faces. From inside the house looking out, it seems even more glaringly bare. Ideas for replacing our overly-vigorous running bamboo came pouring in from readers after I requested suggestions. And there were such great options. We wanted the look and performance of bamboo, but in a manageable form. Megan of Nest Maker suggested the Bamboo Garden, a local specialty nursery in North Plains. After checking them out on line and looking at the cold-hardy clumping bamboos, we knew we needed to make a trip out there. Regretfully, I didn't have the sense to take pictures, but we had a fabulous time looking around at all the options. If you need a bamboo for any situation in your garden, they have it. And it's great to be able to see mature specimens in their display gardens. 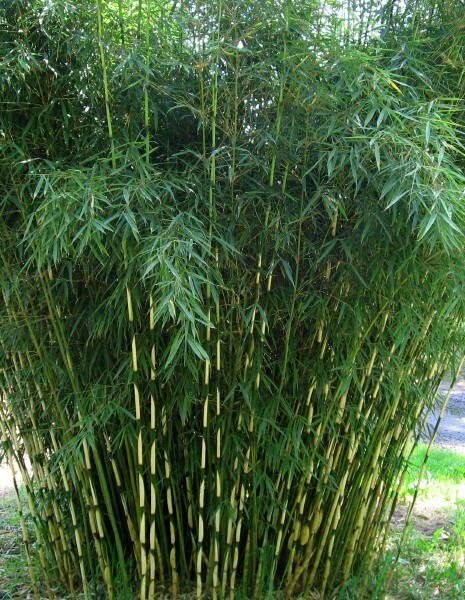 We ended up selecting five 2-gallon pots of Fargesia robusta "Campbell form", a cold-hardy clumping bamboo. They're small pots, with just three to four culms in each, but they're far too expensive not to do the deferred gratification thing for awhile. The Campbell form is more upright than the other Fargesia robusta cultivars, so it seemed the best one for our narrow planting area. Here's our inspiration for the future - a photo of Fargesia robusta "Campbell" I borrowed from the Bamboo Garden website. This clump looks to be about four to six years old. It's beautiful, with that striped effect created by the husks on the new culms. In our excitement at finding a clumping bamboo that worked, we sort of overlooked the fact that the Fargesia would like a bit more shade than it will get right now. Although this bamboo was field grown and should be more tolerant of sun, these pots had been in a greenhouse. Since we want our new bamboo to have the best possible start, we'll delay planting it until September, when the sun isn't so intense. Our bamboo is currently residing on our covered back patio (with a skylight cover above it) where it can pretend it's still in the greenhouse. Meanwhile, what about our glaring lack of privacy? I had some reed fencing left over from covering a gate, so I tried it out on one panel of the fence. Success! By fitting the reed tightly into the black-painted fence panels, we got a slightly Asian look, and it will probably hold up longer than if it was just hung on the fence. So far, we've only covered the fence where the bamboo was removed, but we're so happy with the improvement that we've decided to cover the complete east side of the back garden. The reed fencing creates the illusion of privacy while being open enough to allow some light and good airflow. The reeds will probably last about as long as it takes for our existing screening plants (and the new bamboo) to really take over the job. Why didn't we do this three years ago??!! For the rest of summer, though, we can grow some vegetables in the vacated land. I got an acorn squash, a zucchini, and some basil starts to take full advantage of this sunny spot for the next couple of months. With any luck, I'll even get to plant them this weekend since it's going to cool down a little. Wonderful red stems on this little Japanese maple seedling. They glow when lit from behind. Sadly, this Mahonia nervosa is dying, and I don't know why, since its neighbor Mahonia are quite healthy. But at least it's expiring in fiery, red glory. The hummingbirds have arrived now that Agastache 'Acapulco Orange' is in bloom. Achillea 'Summer Wine' is very red. Crocosmia 'Lucifer' also attracts hummers. A lot of my reds tend toward orange. It's probably because of the Spanish pirate in my ancestry. This is Punica granatum 'True Dwarf', a dwarf pomegranate. The red spike and thorns on Agave parryi var. truncata are just fabulous. The young foliage of Loropetalum chinese 'Sizzling Pink' is a purple-red. Astilbe arendsii 'Glow' is still tightly closed, but will bloom with glowing red flowers. Whatever sedum it is, it has a great red flower. Dark-red new leaves on the Malus 'Prairifire'. And a few red crabapple fruits. Red and green sedums in a succulent planting. Okay, I'm cheating with this red tag, but the real point is the plant it's attached to. It's a clumping bamboo and I'll post about it soon!